Yesterday Pete and Richard were doing their book launch, but before that, they had an interview on BBC Guernsey radio with Jenny Kendall-Tobias. Surprisingly she read three of their poems, and very well too, but it was obvious that she became quite emotional as she read them. It was very interesting to listen to it all, and good publicity for A Guernsey Double. Pete said that the book launch in The Greenhouse went very well, with Pete and Richard reading about five poems each. They had also been asked to give another interview on Guernsey radio. Today Pete and Richard did a book signing session at The Guernsey Press shop. 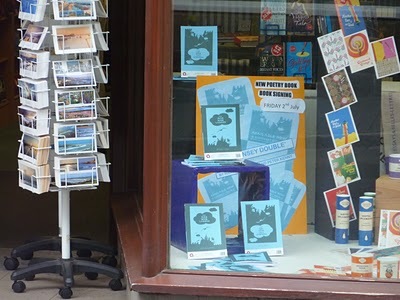 The Press was displaying their book in the window, The Guernsey Double of The Boy Who Fell Upwards, and The Man Who Landed. (picture copied from Pete's blog) Lorraine is due to fly over and join Pete tonight. Back home, Mas and I had to go to Stanmore, but as the weather was so hot we called in to The Man in the Moon where Mas had a cold lager and I had an icy shandy.